Dominick McKenzie, better known as Kid Squeak, was widely known throughout the Coal Region as a prizefighter-- and a colorful criminal. In the boxing ring he never amounted to much; although he faced dozens of opponents, his fights were almost always relegated to preliminary bouts. However, as a criminal, Kid Squeak was far more accomplished. 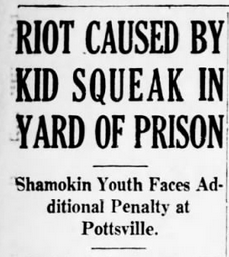 Kid Squeak earned his nickname on the rowdy streets of Shamokin as a teenager, presumably because he was the type of juvenile delinquent whose mouth always got him into trouble. It also didn't help that, at a mere 110 pounds, Kid Squeak was far from being a heavyweight. But the frequent drubbings he took in the ring didn't discourage him; by most accounts, he was scrappy and always put up a respectable fight. McKenzie first entered the professional ranks in 1926 at the age of 17. In March of that year he was beaten by Mount Carmel's top bantamweight, "Pet" Muldoon, and fought to draw against Shamokin's Tony Scicchitano. In October he lost to Cotton Davis and fought to another draw in a re-match against Scicchitano. In spite of his lackluster performances, Kid Squeak always believed that he was the toughest guy in the room and in November he got his first taste of incarceration after he tried to prove his toughness at Antler's Cafe in Shamokin. It was around 3:30 in the morning on a Monday night when Squeak entered the establishment on Independence Street and told the proprietor, Frank Purcell, that he was going to single-handedly "clean the place out". He didn't get very far, however; within a few minutes he was being dragged to the police station by Officer Harry Covaleskie. Chief Burgess Shissler sentenced him to five days in the city lock-up for breaking curfew and put him on a "bread and water diet". When Kid Squeak asked what that meant, the magistrate replied,"Bread and water means bread and water." In May of 1927, Kid Squeak was arrested and held on $500 bail for his role in a Sunbury shooting, for allegedly holding down a man by the name of William Sokoloski while a Shamokin thug named William Hancock shot him in the foot. On his way to court in Sunbury on May 18, he was identified by another police officer as the person who had assaulted Archie Poulson, co-owner of the Busy Bee Restaurant. In early July, Kid Squeak was sentenced to eight days in lock-up for fighting and threatening a police officer. Just a few days after his release he was arrested again, for stealing five tires. On January 17, 1928, Kid Squeak was one of three youths arrested for stealing a vending machine from the lobby of Walter Jacobik's hotel in Mount Carmel. While being transported to the Sunbury jail Squeak attempted to escape by slipping the cuffs and making a dash for it, but was apprehended two hours later after falling into an icy creek. As usual, Kid Squeak didn't wait very long after his release to get arrested yet again. 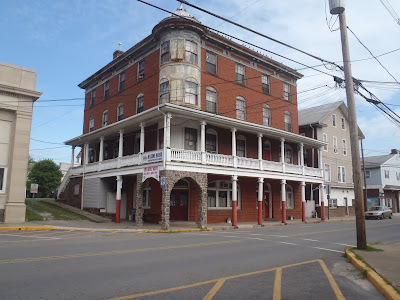 On May 1, 1928, he was sentenced to ten days in the city lock-up by his old nemesis, Chief Burgess Shissler, after Stanley Doniloskie accused Kid Squeak of stealing a slot machine from his pool hall on Shamokin Street. Squeak later returned to the pool hall and made a scene, at which point Doniloskie gave Kid Squeak a healthy dose of (according to one newspaper report) "physical punishment". In October, state troopers stationed in Tamaqua arrested a Hazleton car thief, Frank "Lefty" Yoncuskie, who was known to have been involved in some criminal exploits with Dominick McKenzie. Yoncuskie, under heavy police grilling, made a complete confession and implicated his old friend, Kid Squeak. When police searched Kid Squeak's home, they discovered a stolen automobile parked in the garage. The former pugilist, however, was nowhere to be found. County Detective Charles Densevich was charged with the task of finding him and bringing him to justice. Kid Squeak evaded capture for over a year, but was caught red-handed when he, along with his pals Al Corcoran and John Yudock, broke into a Mahanoy City cigar store on the night of November 11. 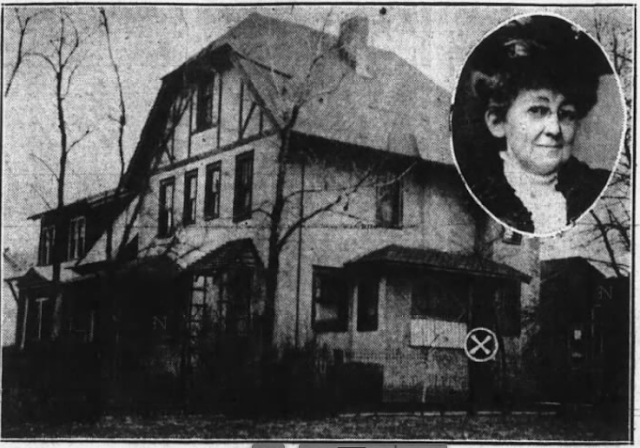 The bandits were taken to the Schuylkill County prison to await trial, and Detective Densevich declared that the tools confiscated from the three men were also connected to several other robberies and break-ins throughout the Coal Region. It appeared that Kid Squeak had graduated from petty theft to full-blown felonies, and it seemed to be only a matter of time until the scrappy boxer from Shamokin faced hard time in a state prison, rather than the week-long "bread and water diets" handed out by local magistrates. While the three bandits were locked up in county jail, investigators and prosecutors were busily pasting together an iron-clad case against Kid Squeak, linking him to robberies of the Sunbury High School, Coal Township High School and an elementary school in Trevorton. Additionally, Kid Squeak was accused of a safe robbery at the Shamokin and Mount Carmel Transit Company and other safe robberies in Kulpmont, Aristes and Bloomsburg. Kid Squeak and his pals denied all charges, but were eventually convicted. In January of 1930, Judge Hicks of Schuylkill County handed out a sentence of six and a half years of hard labor and solitary confinement to Kid Squeak, Al Corcoran and John Yudock, to be served at Eastern Penitentiary. Records indicate that, in spite of his recalcitrant behavior, Kid Squeak was a model inmate. In 1932 he was paroled from Eastern Penitentiary, but found himself in hot water on his first day of freedom after he learned that paroled inmates were required to be off the streets by midnight. At Justice of the Peace Culton's office in Shamokin, upon hearing the conditions of his parole, he unleashed a verbal barrage at state trooper Cyril Edwards, who had him arrested on a charge of interfering with an officer. On Christmas Day of 1932, Kid Squeak was arrested once again for fighting in the streets; he was forced to pay a fine of ten dollars. In February of 1933, law enforcement cracked open a case involving a string of robberies across the Coal Region. It all began when two Shamokin criminals, Ralph Piccolo and John Roth, were arrested in connection to the fatal shooting and attempted robbery of Pottsville racketeer Howard "Red" Smith. Roth and Piccolo signed confessions detailing a number of hold-ups from Pottsville to Hazleton. Implicated in the statements given by the two men were Al Corcoran and Dominick "Kid Squeak" McKenzie. As a result, Squeak's parole was revoked and he was sent back to prison to serve out the remainder of his original sentence, which meant that he would not see the light of freedom again until January 10, 1943. 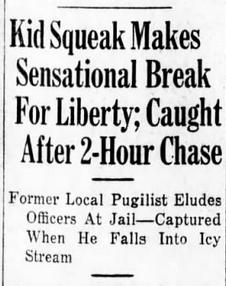 Kid Squeak was still imprisoned at the Schuylkill County Prison in July of 1934 when he attacked another prisoner with a baseball bat following an argument in the jailyard. When a prison guard tackled Kid Squeak, the notorious bandit's old buddy, Al Corcoran, jumped to his defense. The guard called for help and within seconds a detachment of guards armed with tear gas guns arrived on the scene, inspiring more than a dozen inmates to riot. New charges were filed against Kid Squeak and Corcoran for the attack on guard William Sweeney, who, according to court documents, suffered a "badly chewed arm" in the fracas. The guard's badly chewed arm, however, was of little consequence to Kid Squeak, who had been convicted in the meantime for his role in a Girardville grocery store robbery that had occurred during his time on parole. He was hit with an additional sentence of 5-10 years for that incident, and was still facing penalties for dozens of other robberies that he and his gang had perpetrated. All of these penalties would have to be paid at the conclusion of his parole violation sentence. In March of 1936, Kid Squeak and Corcoran were given an additional 4-8 year sentence for robbing the home of Ashland movie theatre owner J.V. Schreck. 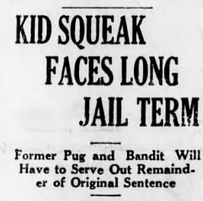 This meant that Kid Squeak would not get out of prison until 1955 at the earliest. And there were still more charges to face. However, through several appeals and a massive amount of legal wrangling, Kid Squeak was able to convince the parole board that he was a reformed man, and in the spring of 1946 he was released from Schuylkill County Prison. On April 15, 1946, however, he was charged with assault and battery after allegedly beating a Mount Carmel woman named Dorothy Blessing, but was later acquitted. On January 25, 1948, he was sent back to prison for violating parole, on charges of "associating with gamblers" and other individuals of ill repute. Squeak-- no longer a kid at the age of 39-- was sent back to Eastern Penitentiary to complete his original sentence, which was set to expire on March 16, 1951. Kid Squeak, in spite of numerous appeals, ultimately served out his entire sentence and spent the remainder of his life in Shamokin with only the occasional run-in with the law. He was a fixture at local pool halls and back-room poker games, but the thrill of cracking safes and robbing businesses had evaporated with his youth. His pugnaciousness, however, never quite went away, and neither did his affinity for hanging around shady characters. In 1965 he was charged with assault on a neighbor and in 1971, at the age of 61, he was charged with being an accessory in the shooting of a Pottsville man, although his role in the incident was minor. While there were some reports that Kid Squeak had once been charged with involuntary manslaughter for beating a boxer to death inside an Atlantic City ring in 1926, this, it seems, was merely a lie told by Kid Squeak that somehow made it into the papers. History does not record Dominick "Kid Squeak" McKenzie beating anybody in the ring-- much less beating an opponent to death.